When the Tesla Model X first showed up in concept form in 2012, I think everyone looked at it and said "Those crazy DeLorean-style doors are neat, but there's no way they'll be on the production car." Turns out everyone was wrong! Our pals over at Green Car Reports have a ton of Model X-related news on the heels of a lengthy Tesla Q&A session with owners in Norway. The biggest tidbit is probably that the Model X — which is based on the Model S and will come standard with all-wheel drive — will indeed have the folding "falcon doors" that made the concept so notable. Other items of note in the Q&A include a coming all-wheel drive Model S, and that they're still gunning for a price tag of $30,000 to $40,000 for the 3-Series fighting Model E.
"Giga factory!" Interesting. 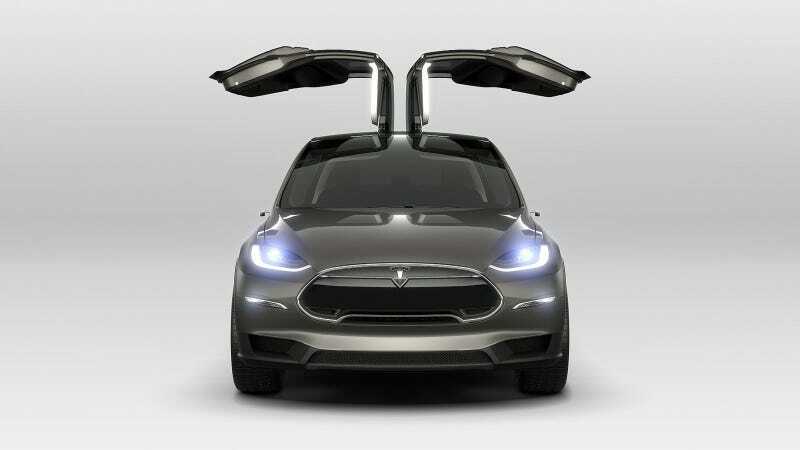 I'm glad to hear Tesla went full-on crazy with the Model X doors. Those will go a long way toward making the car more than just a Model S SUV, which would have sold strongly in and of itself. And by "sold strongly," I mean "there's gonna be riots in the Valley over this thing." Check out more info over at Green Car Reports.